Gwendolyn Brooks (1917-2000) was born 21 years after the United States Supreme Court declared that "separate but equal" - between whites and people of color - was legal in America. That ruling - in a case called Plessy v Ferguson (1896) - led to all kinds of trouble, including "Jim Crow Laws." African-Americans were denied their constitutional rights, especially in the South. It wasn't just in the South, however, where black people were negatively impacted by America's laws and culture. One day - in the 1950s - Gwendolyn Brooks was walking down a Chicago street when she saw a group of school-age black boys in a pool hall (instead of being in school). Brooks wrote about those boys - and - how their lives would go, if they did not change. 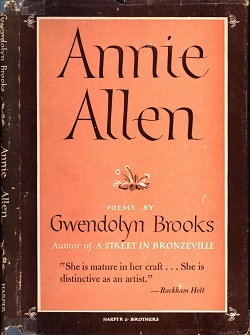 In this audio clip, Carole Bos (the creator of Awesome Stories) reads Gwendolyn Brooks' most-famous poem. Think about these topics as you study the words. ISSUES AND QUESTIONS TO PONDER: What is Gwendolyn Brooks telling us when she places the word "we" at the end of her lines? Do the boys realize the path they are on - or - is the last line the poet's conclusion only? Without first hearing "We Real Cool," how would you have read it aloud? Does it surprise you that an African-American woman was writing rap-like lyrics long before rap and hip-hop became popular? Do you think a case could be made that Gwendolyn Brooks - with "We Real Cool" - invented rap? The scene in this poem takes place in the 1950s. Are times different now? If so, how are they different? If the words in this poem were about you - or someone you cared about - what could be done to change that course of life? "We Real Cool," by Gwendolyn Brooks. Copyright, Gwendolyn Brooks, all rights reserved. Provided here - and read by Carole Bos (creator of Awesome Stories) - as fair use for educational purposes. Bos, Carole "We Real Cool, by Gwendolyn Brooks" AwesomeStories.com. Oct 07, 2013. Apr 23, 2019.